Shurijo Castle, which prospered as the Ryukyu Kingdom's center of politics, is part of UNESCO's World Heritage and one of the most-visited historic sites on the island. 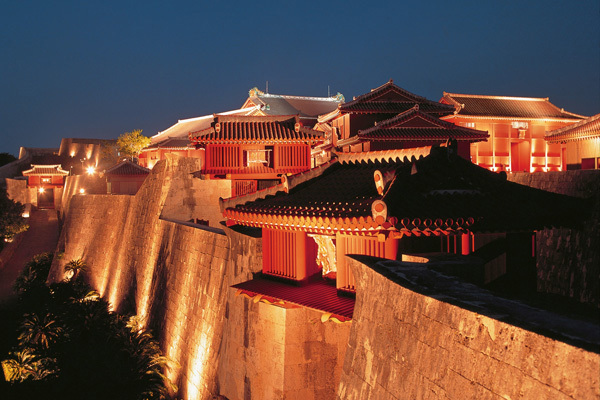 The exterior walls and nearby historic buildings are lit up until midnight every evening throughout the year. The castle area is divided into free and paid areas. You can enjoy a romantic night walk within the free area, and from Iri-no-Azana, which used to be a lookout for the castle, you can enjoy a breathtaking night view of Naha City below. The place is very popular among Okinawan locals as well.